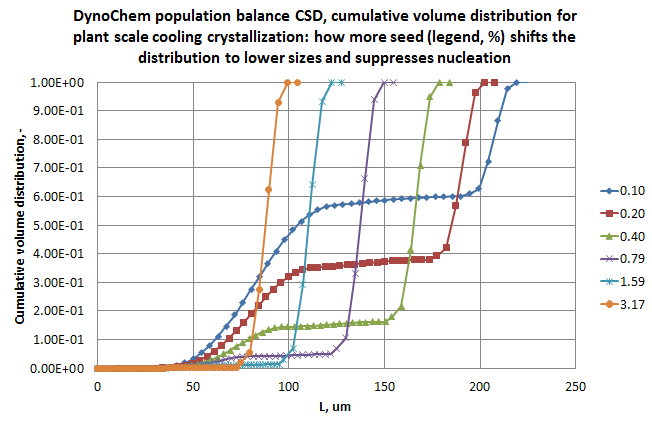 Templates that use nucleation and growth kinetics in population balance models have been available in the DynoChem online library for some time. These are a great alternative to writing all of your own code for this problem in MatLab or Excel, or investing in complex software that is in permanent beta-test mode and 'one up from Fortran'. On the other hand, our templates give you total control over the form of the rate equations, so they are ideal for research purposes. And you benefit from the features that power users love, like variable time steps, stiff solvers, flexible data handling in Excel format and so on. DynoChem provides a general-purpose platform for operation modeling and the same environment can be used for anything from early phase reaction kinetics by process chemists through to late phase solvent swap, filtration and drying by process engineers and beyond that into drug product, dissolution and stability applications. In the pharmaceutical industry, makers of API find countless opportunities to apply these tools over and over again. Our population balance models come in various shapes and sizes, depending on what you need to accomplish. The most rigorous of these divide the distribution into size 'classes', with linear or log-spaced intervals, and calculate the number of crystals in each class during nucleation and growth. Another variant does the reverse, with breakage and dissolution as API crystals dissolve from a tablet in the USP apparatus (or the stomach). 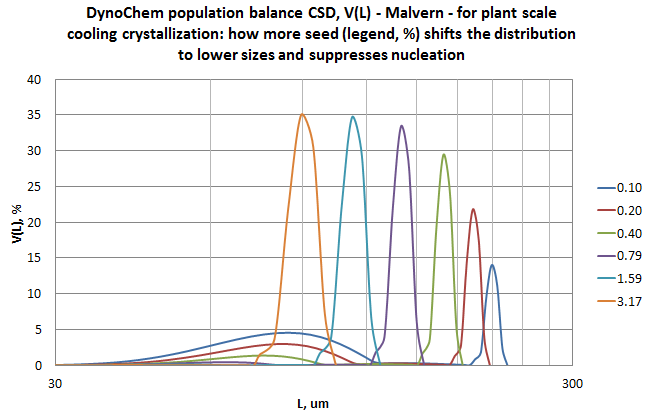 Knowledge of solubility and measurement of some crystallization profiles (notably solute concentration during crystallization) allow the kinetic parameters to be estimated, using the classical approaches described in Mullin's book and many other places. 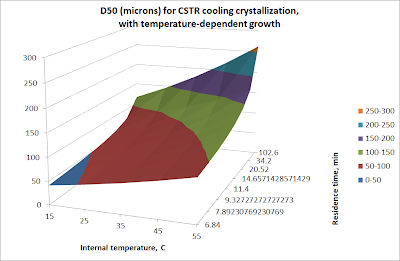 Armed with reasonable estimates for these parameters, valuable insights into the CSD may be obtained. During antisolvent crystallization, composition gradients may exist near the feed point and even this can be predicted efficiently using meso- and micromixing models implemented by our team of fluid mixing experts. In general, equipment characterization completes the picture, with the ability to calculate heat transfer, solids suspension and power per unit volume using simple 'utilities'. 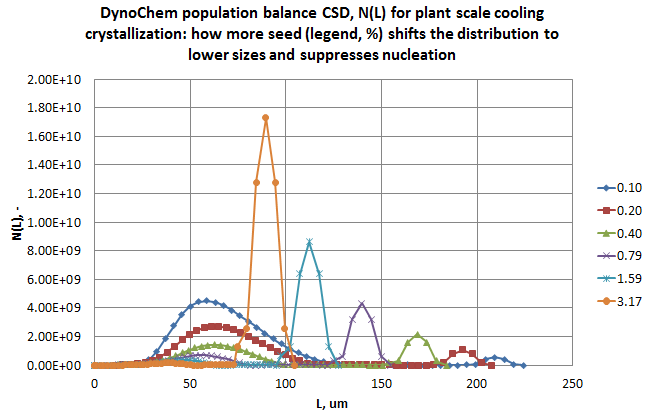 Here we show the beneficial impact of seed addition during a cooling crystallization: more seed (up to maximum 3.2% in this case) suppresses nucleation, eliminates a bimodal size distribution (and filtration problems plus product variability concerns) and leads to smaller sizes and a tight distribution. Interaction between chemical reactions and mixing on various scales is an important topic in both industrial applications and education. Our colleague at Scale-up Systems, Dr Steve Hearn, authored a paper of this title in 1997, on completion of his PhD with Professor John Bourne and Professor Jerzy Baldyga (their subsequent book available here). Steve's paper demonstrated the importance of 'mesomixing' for chemical reactions with fast kinetics and has been cited heavily when this concept has been applied since that time to reaction and crystallization systems, for example. Steve's PhD included measuring and modeling 'Bourne' reactions (azo-couplings of 1- and 2-naphthol) in a Kenics static mixer and varying the flowrate / energy dissipation and fluid viscosity. 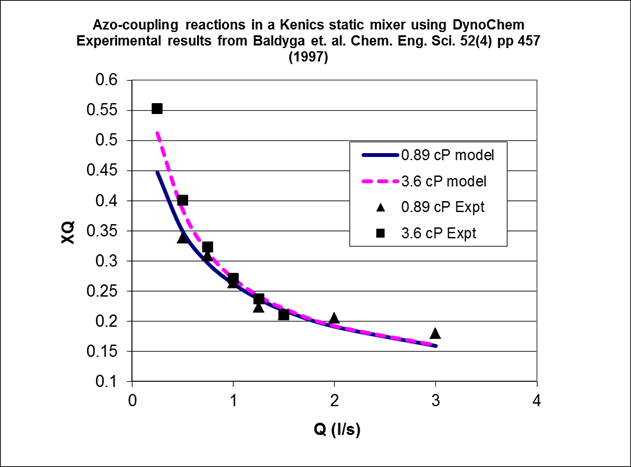 These were some of the first models we included in DynoChem and the figure below shows comparison of measured and predicted 'XQ' values. Low XQ (side-product formation) corresponds with faster mixing. In addition to template models containing the competing chemical and mixing time constants as parameters, we also included 'utilities' so that user can quickly estimate the time constants from reactor geometry, operating conditions and feed position/ rate. And together with Professor Bourne and other leading authorities on mixing, we built a range of knowledge base articles from which users can learn all about it. We will return to this topic in subsequent posts on DynoChem Resources online library models that apply these concepts to predict mixing effects in a range of systems. Customer requested updates to the industry's best solubility tools, making them easier to use, with CAS Number references in the solvent selection tool and the ability to move your preferred late phase solubility expression into other workbooks for hand calculations. Slides from recent guest webinar by Dr Gearoid Duane on bioreaction modeling. You can see a full list of changes in the WhatsNew document. To try out the tools and content log in at https://dcresources.scale-up.com/. The impact of physical processes on the performance of manufacturing operations is well known. Good accounts of the basic problem are available in many textbooks, such as that of Zlokarnik, Atherton & Carpenter and many more. Regulators understand this too, with the word 'scale' appearing 25 times in ICH Q11, with statements like "The development ... should account for scale effects and be representative of the proposed commercial process". It is remarkable then that much airtime is given to laboratory scale statistical design of experiments as a vehicle for efficient process development, without adequate discussion of how the DOE results can be made scalable. The good news for the drug substance / API synthesis community is that the necessary concepts for scalability are well established and can be put into practice with DynoChem software tools that are easy to use. You can for example achieve equivalent 'mixing' between 100 mL and 1500 L reactors, or match addition times / cooling rates between lab and plant, by investing 15 minutes of your time. Doesn't that beat having to deal with missed deadlines or increased impurity levels on scale? And the associated process rework? We made a carton animation to raise awareness of the problem and the opportunity. If you see the potential, sign up for DynoChem access.